Learn more about some cases in which inactive quarries now favor the surrounding environment and communities. A study by the Évora University (1), in Portugal, evaluated the evolution of ecological recovery in 12 inactive quarries (open mines) in the counties of Estremoz, Borba and Vila Viçosa, in southern Portugal. Various species of protected bird life were identified, as well as flora which is considered rare or vulnerable and habitats which are different from those originally found in the area. It was found that the inactive quarries contributed to the complexity of the landscape, allowing for the emergence of new habitats and, consequently, new species — for examples, fish and amphibians. Sufficient reason for the birds to also adopt these abandoned areas for shelter, food and nesting. The researchers suggest that these quarries be transformed into areas of ecological interest for bird watching, environmental education and the advancement of biodiversity. The objective is to reformulate the problem and turn it to an advantage, as has often been the case where innovative solutions have been found with economic, environmental and sociocultural benefits. In Toledo, Spain, the old Lafarge cement quarry, Yepes-Ciruelos, is a success story with regard to the recovery of flora diversity. The rehabilitated area is now a natural reserve with more than 190 species of plants, some of which of high ecological importance and it is also a refuge for various bee colonies. The area is also reserved for academic research. At the Shek O quarry, in Hong Kong, the objective was to create conditions so that the landscape could merge with the adjacent environmental communities, with similar flora and fauna, and thereby develop a sustainable ecosystem with habitats suitable to a variety of wildlife, birds, mammals and insects and to guarantee safe breeding areas for peregrine falcons. A marina for recreational use was also created with access and parking areas. 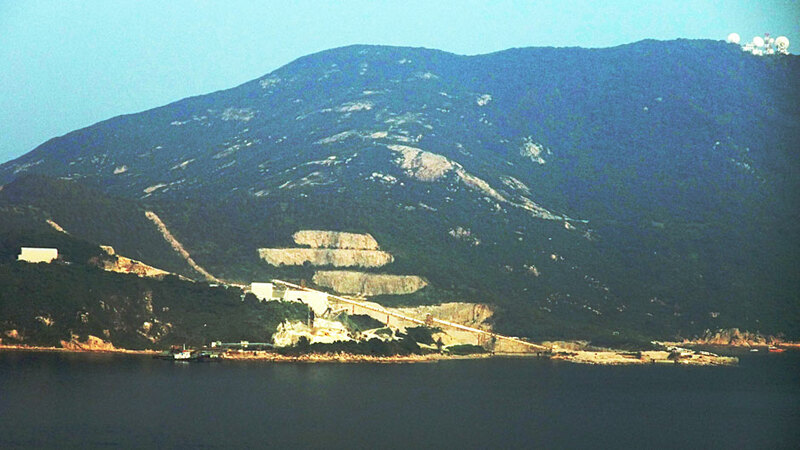 The Shek O is today a recognized and awarded winning example of the rehabilitation of quarries. The world’s biggest dinosaur tracksite was discovered in a quarry in the hills of Aire and Candeeiros, in Portugal. 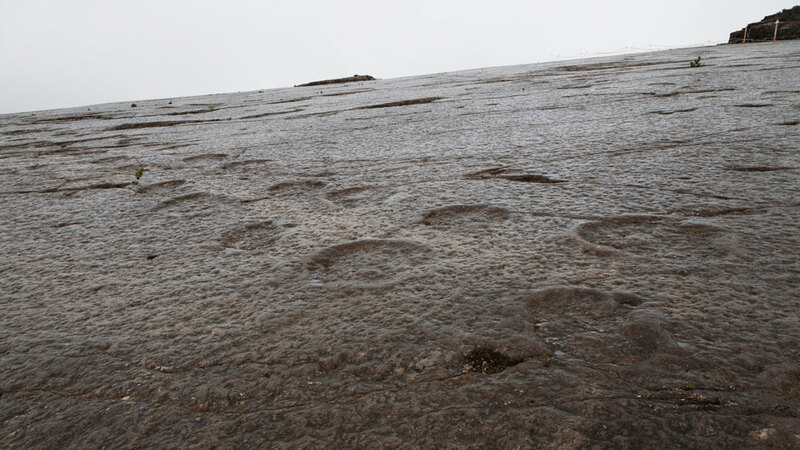 Since the discovery, support structures and educational circuits have been created in that which is today known as the Natural Monument of Dinosaur Footprints. In the very same hills (where SOLANCIS quarries are located), 222 hectares of abandoned quarries were recuperated between 1955 and 2014. The green covering of the Shimao Quarry Hotel text: Shimao Quarry Hotel popup: yes), 30 kilometres from Shanghai, China, is there for two reasons. One is the environmental and energetic advantages it affords. The other is due to the fact that it was intended that the building fit perfectly into the inactive quarry landscape where it is being built, making it part of the local topography. The expectations are high, but there is nothing more to do but wait until 2018, the year in which the construction of the five star hotel should be finished. 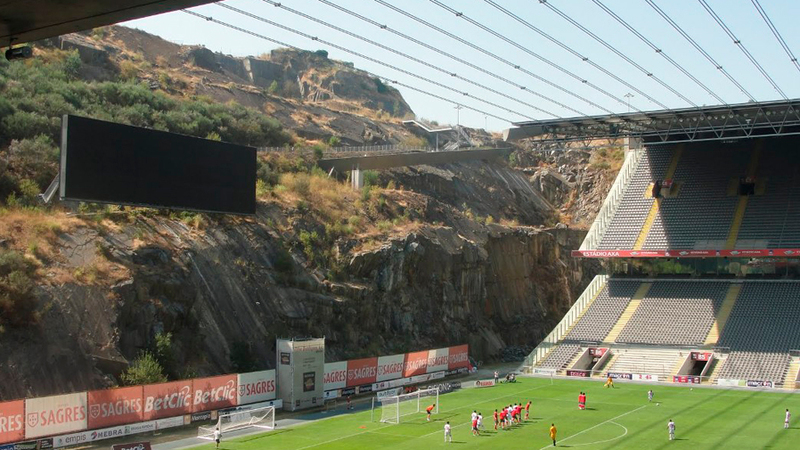 The Municipal Stadium in Braga, in the north of Portugal, earned its nickname “Quarry Stadium” due to the fact that it was built on the site of an inactive quarry, perfectly visible at one of the goal ends. The stadium, designed by the architect Eduardo Souto de Moura for the Euro 2004 competition, has won various awards. The last quarry we refer to here is that of St. Margarethen, in Austria,transformed into one of the most impressive open air auditoriums in Europe. The architecture of the structure allows for a unique experience for the 220 thousand visitors who enjoy the annual classical music festival here. The area is fully inclusive with access that allows all to enjoy the experience. 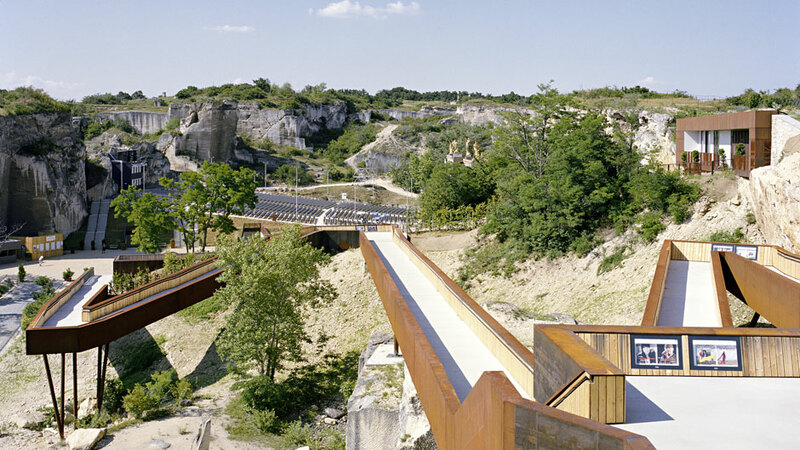 Do you know of more examples of successfully rehabilitated quarries? If so, share them with us.